Im always looking at new opportunities to see more of climbing. And nowadays I get more and more again into alpinism again. So, I saw the website of Menno again. Just to look at his amazing pics. Im some way he, and some other climbing photorgaphers can get me hooked. Hooked onto things again. Alpinism for example. There you can find the best climbing vids ever. Well, not all, but at least a lot. Same actually for ordering stuff which is not being sold in the Netherlands. Haresses and more gear like that. Take a look at this French website. Enough climbing on this late evening. Altough, can climbing ever be enough? 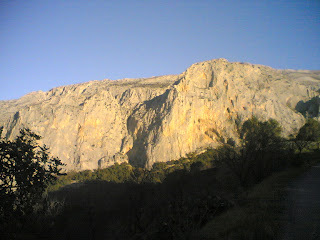 P.S; the pic is of El Chorro, Malaga, Spain. Where Valdi and I were this winter. I´ll tell the whole hitch hinking story later on.